Someday Weʼll Live Like Horses. 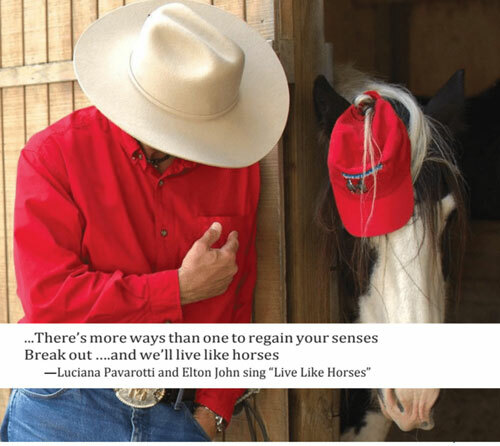 The lyrics in this song recorded by Elton John and Luciana Pavarotti challenges us to someday live like horses, taking down fences, removing the barriers that exist inside of us and between us. In doing so, we may live more freely and joyfully. I believe this is one of the lessons that horses and nature teach us. In no way are we horses, nor do we try to be them at Pebble Ledge Ranch, but we can learn with them and from them how to be better human beings and leaders in our lives Members of the Spirit of Leadership Herd at Pebble Ledge Ranch – seven wise horses and one courageous zebra–came to the ranch from highly diverse backgrounds. The stories of their lives, past and present, are fascinating tales about magical moments and relationships that continue to develop between humans and herd as the emphasis turns from the roles of horses in a human world to that of humans in the horsesʼ world. Telling their stories I can share their horse sense and wisdom and open a pathway to exploring authentic presence in leadership and life. Untapped human potential lives within all of us. Finding it may be difficult because we are surrounded by external information, noise, and technology. Sometimes we lose ourselves, lose the pathway to our own inner knowing. We lose the way of being authentic that can guide us through life’s complexity and unknown terrain. In the quiet open space of nature and the authentic presence of the horses we can better discover our true human identity. Each day we create consequences that we do not intend. We can become aware of the consequences of our choices and actions. We can begin to take responsibility for the power of our influence and explore a more expansive way of being consciously human within the more than human family of life. Finding ourselves and creating alliances with like-spirited people and beings, we can move forward, like the horse herd, with innate intelligence galloping toward a positive horizon. 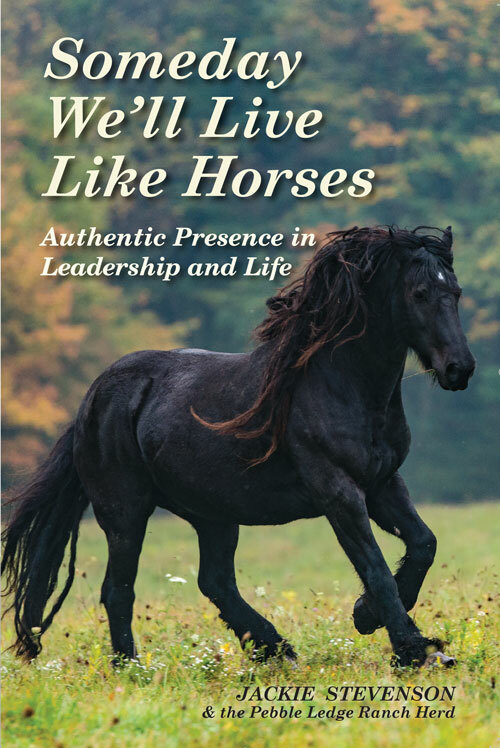 My book, Someday We’ll Live Like Horses; Authentic Presence In Leadership and Life, is inspired by horses and nature and is an invitation to listen for your answers and to take your own journey into your authentic presence. As leaders in our families, places of work and communities at the heart of authentic presence is the challenge to learn what really matters to you, why you do what you do, and how to fulfill that promise. Join the journey into the world of horse and herd to learn about you. A zebra chasing bubbles, a pony drumming, horses helping people heal, leaders listening from within, a herd running free - just another day at Pebble Ledge Ranch. Opening to the unexpected and to every day miracles we can shift our perspective of reality beyond what we expect and move to a reality far beyond what we believe is possible. I believe that all of us have the ability to turn the ordinary into the extraordinary when we live with authentic presence. Finding our herd and following our unique path of purpose we have the capacity to do remarkable things and live a remarkable life. Walking or galloping together in a common direction we can make a positive difference in our lives and the lives of others. This is what inspired me to discover what authentic presence is for me and to invite others on this journey of passionate dreams and purposeful destiny with horses and nature as our guide. Our authentic presence is already within us, it is about owning it, and about showing up in life fully and truthfully. What matters is being real, living with meaning, making mindful decisions and taking purposeful action. Our authentic presence is our unique signature. It contains everything about us — our strengths and our challenges, our conscious and unconscious knowing. Our authentic presence determines how we engage in relationship with ourselves and others. It is reflected by the alignment of who are, why we are and how we are in the interconnected network of life. Nature, horses and the wild operate from an authentic, inherent and collective intelligence and can guide us to that place of wisdom within ourselves. In relationship with nature, in the company of horses and other beings of the wild we can slow down, quiet our mind, and open our hearts to connect from a place of authentic and innate knowing. It is a practice of loving kindness learned and earned by a positive sense of self and by compassionate engagement and relationship within the world. From this expansive way of being authentically present we can find our unique voice and allow something vitally important to emerge. Like horses in their herds and all families of nature in the wild we can move beyond in our current reality, create the conditions for our best possible future to emerge and then be there to greet it. This is the journey to the spirit of authentic presence. I believe this is why passionate seekers, curious people, and reluctant adventurers are drawn to meet the horse herd that lives at Pebble Ledge Ranch, in the forestland and hills of northeast Ohio. Some people come to the ranch to solve problems in their professional and personal lives. Others arrive to strengthen their leadership and team work abilities. Some come to heal emotional wounds. Some people are sorting out complex relational dilemmas, others are seekers at crossroads in life looking for answers to decide which way to go. People of all ages arrive seeking a more playful and fun life and to discover creative and meaningful solutions to normal life challenges. Some folks are wandering about looking for their herd and place of belonging. Many people are blessed with knowing they belong, and experience their life as wondrous. Most, whether they know it or not, are at the Ranch to evolve and strengthen their ability to flourish in their lives and to help others do the same. People that transform the lives of others intuitively come here to this sacred land and herd of gentle hearted horses and a courageous zebra to transform their own lives. In this wise, imaginative, and moving book, Jackie Stevenson conveys Eight Paths to Authentic Presence through compelling stories from her treasure trove of profound experiences working with equines as collaborators. Raven, a horse whose ancestors carried knights into battle, brings a wounded warrior back to wholeness. Spirit the soulful paint mare, Holly the zebra, and other members of Jackie’s perceptive herd work their magic with people from all walks of life. Together, these potent tales of healing and empowerment show us how learning to live like horses can help us negotiate life’s challenges, gifts, and mysteries with grace, courage, compassion, and fun! This book tells of CEO’s and veterans, teens and therapists becoming aware and being authentic, feeling their heartbeat through a deep connection to one of Jackie Stevenson’s horses (and zebra) and their herd. She offers humorous and moving stories woven into lessons for living and learning. It is a zen experience with the smell of fresh hay and evidence of horses. Joining a herd is a total immersion and far more than joining “friends” on social media. Put on your boots, read it and get ready for the ride of your life! This engaging book offers gentle insights and appealing wisdom to enable us to discover our authentic presence and purpose, and enact the best of our unique selves. Through captivating stories of a herd of horses and appreciative lessons of nature, we learn how to cope with our challenges and emerge as authentic leaders who serve the people in our lives. A delightful, evocative, and self-reflective read for those who seek to make a positive difference in our world! Some Day We'll Live Like Horses" invites us to awaken to a new state of consciousness and follow the path to a truly authentic existence. Its gift is the transformation of our ordinary life into an experience of peace, joy and connectedness with our fellow human beings and the larger natural world. Jackie Stevenson's deep relationship with her horses and her authentic presence will help readers arrive at greater self-understanding and purposefulness in life. Alice Kolb PhD and David Kolb PhD - Experience Based Learning Systems, Inc.
Who are you? Why are you here? What is your core? What - and where - is your WHY? Jackie's story of life in the herd will inspire you to authenic connection - with all of the natural system - to listen to that still small voice within that connects us all in a giant web of flourishing life. Often it is the unspoken, quiet reflection that we get from authentic connection with, observation of and participation in the natural world - of which we are a part - that feeds us and shows us the path forward for the best possible future. Jackie shows us how to learn to attend to self, to the herd, and to the environmental around us - all at once in a unified, generative systems approach. Watch as your worldview grows larger. Highly recommend this inspiring journey for anyone really seeking. Horses and mankind have been deeply linked for millennia. This book offers a pathway for humankind to connect to the 'herd" of all living beings by discovering our individual authentic presence by deeply connecting with horses as teachers. Good luck Jackie with your efforts to help us remember how to be better human beings. I brought my team out to Pebble Ledge some years ago and we spent two days with the herd. I had some members of the team who were quite skeptical of the approach and actually tried to back out of their attendance. Within the first morning as we explored the behavior of the horses and their leadership styles, we had captured everyone’s imagination. Of course, the fact that certain horses actually selected some of the disbelievers to spend time with during our group discussions helped with the process! The team was deeply affected by the experience and the event became part of our shared culture, and we spoke of it often for years afterward. The closeness with nature and the time to reflect our principles and ways of working together was the best investment we could have made as a team and company. My compliments to Jackie for her unique way of bringing the team and the horses together to achieve a deep understanding of self and of team behavior. I have had the privilege of spending time with Jackie’s herd. It was an experience that humbled me to my core. At one point, the horses surrounded me…carefully, deliberately, slowly. It was, I realized then, a spontaneous act of protection: in that moment, they made me feel safe, safer than I had for many years. The tears came naturally. That experience and the author’s words have led me back to a rhythm that resides in each of us. It is primal, simple, and timeless. And yet it is a rhythm we have mostly forgotten exists. Someday We’ll Live Like Horses stirs that rhythm, bringing it back to life, and inviting us to do one thing above all others: Find, and honor, the “horse” within each of us.